Enjoy this fully furnished 600 sq. ft. guest house, that is located in it's own enclosed yard behind the main house (pool and hot tub for the main house are not included in this rental). It is in a charming, quiet neighborhood just blocks off of upper State Street. LCD flat screen. Wireless internet. Private fenced yard with outdoor seating and a gas grill. The kitchen has a full stove and oven, microwave, refrigerator and is fully stocked for cooking...sorry no dishwasher. The bedroom has a plush top king size bed with down bedding and lots of closet space. The bathroom has a fully tiled shower. Walking distance to great local restaurants, shopping and the bus line, if you do not have a car. Less than 10 minutes to all of Santa Barbara's points of interest, with 2 parks within walking distance from the house. Exploring Santa Ynez wine country is a short 40 minute drive. No Smoking inside of the house. Three night minimum. Starting in 2017, the City of Santa Barbara requires all vacation rentals to be 30+ days. Happily married couple, with plenty of grand kids, living full time in beautiful Santa Barbara. We love to travel, be with our family, play golf and go over the "hill" to wine country. 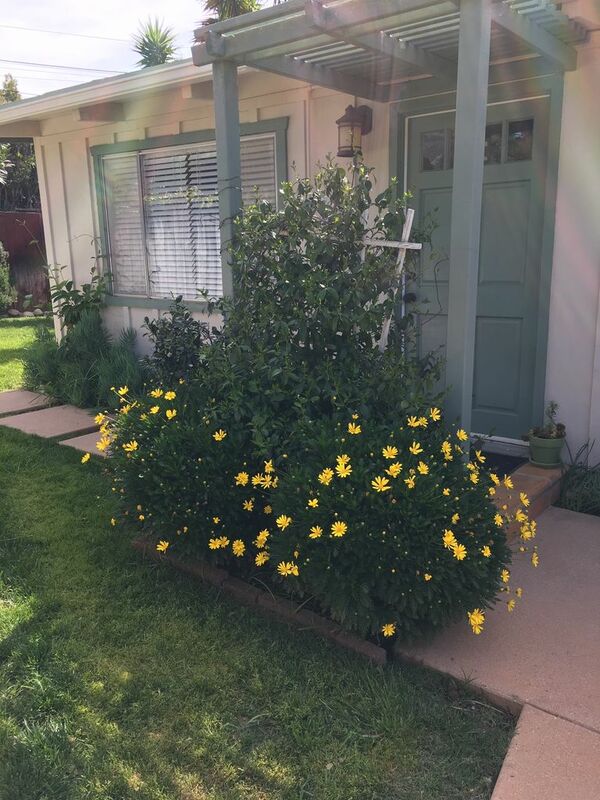 This cute cottage offers a unique location, in the heart of Santa Barbara, in a lovely mature neighborhood, great for taking strolls and riding bikes. Most anything you would want to do in Santa Barbara is within a 10 minute drive, but also in walking distance to many great restaurants, grocery stores, or just shopping. This cottage has all of the conveniences of home. It is a bright and cheery house. Very comfortable for an extended stay. This cottage also offers a private yard with amply space for relaxing outside in the beautiful Santa Barbara climate. The king size bed guarantees a comfortable nights rest. Extra set of sheets supplied. Full size gas stove and oven. Double sink. No dishwasher. Small private patio and back grass yard. Four blocks to Santa Barbara municipal golf course. Non smoking in the house. Smoking allowed outside only. We adored Santa Barbara, and especially loved our stay in this "charming cottage". Very roomy apartment, and the king-sized bed was more comfortable than ours at home. Very easy walking to several restaurants nearby. Santa Barbara is very easy to get around in by car, as well, so we spent most of our time downtown and at the pier. Absolutely hated to leave, but Jody and Bill wouldn't adopt us. We highly recommend this place!! Our wonderful stay in SB was made possible by the accommodations provided by the cottage. The marquee feature of the cottage is the privacy that it provides. The fencing, shrubbery, and separate entrance provide the peace-and-quiet we crave while on vacation. As far as amenities go, the house has everything you need. The wifi was a must for us and it worked well throughout our stay. If you are the type to prepare meals for yourself at home, you will be set. Our stay provided an unusual heat wave for the area, but the AC unit truly saved the day. The location is superb. You will need a car to see the sights (parking is plentiful), but the cottage is centrally located so you can quickly/easily bounce around town. On top of that the hosts were very helpful when needed, but also cognizant of our desire for privacy. For us, it is/was a no-brainer decision to stay at the cottage over a hotel or similar accommodation. We really enjoyed our time in Santa Barbara at this cottage. It was convenient to shopping, restaurants, parks and best of all, golf. There was plenty of room for the two of us, and a full complement of amenities to make our stay easy and comfortable. We are already planning our next trip! Very clean, convenient place to stay. This is a very charming, clean, well maintained cottage with a fully equipped kitchen, a comfortable bed, and a delightful back yard. The owners are extremely friendly and helpful. The location is very convenient to a local shopping center that includes a good grocery store, restaurant, bookstore, and other small shops. It is also near a bus stop at which you can get a bus to take you almost anywhere in Santa Barbara you might want to go--downtown, the beach, UCSB. I have already recommended it to a friend and will definitely stay there again myself next time I am in Santa Barbara. We spent a week here with our four-year-old and were so impressed with the thought that has gone into this cottage. The location, in San Roque, is excellent. You are only a few minutes away from downtown Santa Barbara, but in a quiet neighborhood with restaurants, grocery stores, coffeehouses, a laundromat, and an excellent bookstore. The cottage itself is at the rear of the property, with a gated fence separating it from the pool area. The unit is nicely laid out, with a cozy living room and dining area, and a kitchen with an apartment-sized refrigerator and a full-sized stove. There are plenty of dishes and utensils, as well as a variety of small appliances--we were able to cook everything we wanted, and more. The bedroom contains a very comfortable king-sized bed, and there are plenty of linens available. While the bathroom does not include a bathtub, it does have a spacious shower. We have spent several summer vacations in Santa Barbara, and this was definitely the most comfortable rental we have found in our price range. We would definitely be interested in staying here in the future! The cottage was wonderful, located in a beautiful neighborhood. Bill was a friendly and gracious host, and my family (my wife, one year old daughter, and I) had a great stay. This cottage is in a quiet residential neighborhood. Walking distance to restaurants, Trader Joe's, Gelsons and hiking trails. It is also convenient to Cottage Hospital. Rates are subject to change until reservation is confirmed. Please note: Starting January 1, 2017, the City of Santa Barbara will not allow any short term vacation rentals under 31 days, in the city.